I am the Ultimate Warrior, you are the Ultimate Warrior fans and the spirit of the Ultimate Warrior will run forever. 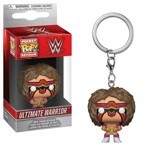 Ultimate Warrior became a two-time WWF Intercontinental Heavyweight Champion and won the WWF World Heavyweight Championship once when he pinned Hulk Hogan in the main event at WrestleMania VI in Toronto, making him the first wrestler to hold both titles concurrently. He retired from professional wrestling in 1998 and embarked on a public speaking career, but wrestled one final match in Spain in 2008.